Michael Mazzeo Gallery is pleased to announce a special presentation of recent photographs by the American photographer, journalist, and social documentarian, Will Steacy. Deeply moved by headlines decrying the perils facing the nation, Steacy, a former union laborer, packed his view camera and drove to Madison, Wisconsin to witness the heated confrontation between union workers and Governor Scott Walker. He spent 24 hours that night and the following day photographing events as they unfolded inside and around the capitol building, as the Governor prepared to sign the notorious bill restricting collective bargaining rights for union workers. Shortly afterwards, Steacy drove to Gary, Indiana, home to the first US Steel plant, and a city whose rise and fall has become a symbol of the plight of the American workforce. He photographed up and down Broadway, Gary’s main artery, documenting City institutions and local businesses, revealing the grim challenges that now face this once-vibrant city. Photographed in 48 hours, Steacy’s understated, quietly seductive images reveal an undercurrent of catastrophic anxiety enveloping the American psyche while pointedly exposing the harsh realities of a nation torn apart by misguided government policies and corporate greed. 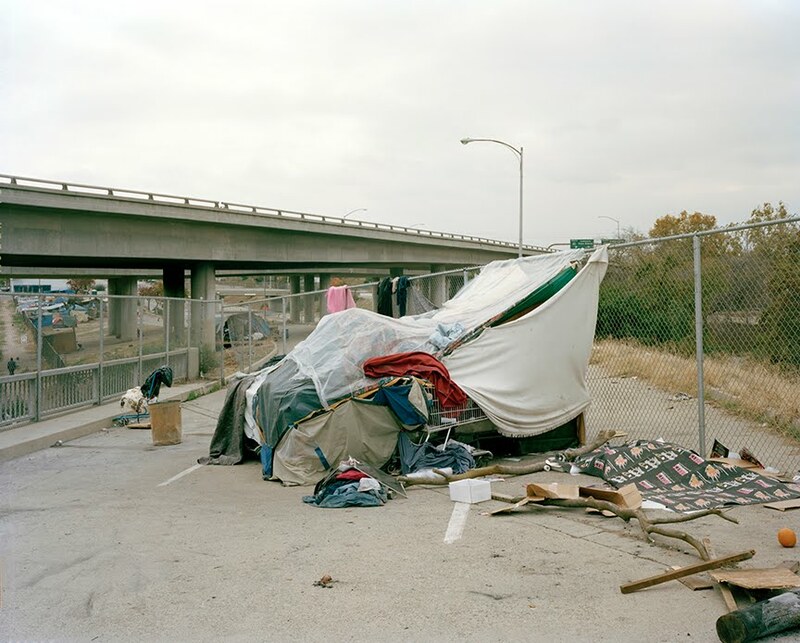 An outspoken critic of inequality and injustice, Will Steacy’s images, insightful, confrontational, and elegant, offer hope and renewal to a nation divided. Will Steacy is honored to dedicate this exhibition to his mentor, Charles Gandee, 1952-2011. Aperture is also excited to offer this limited-edition print by Will Steacy, one of five emerging artists selected by Aperture for the NYC Green Cart Photography Commission. This is the first of a series of limited editions from the Green Cart artists, soon to be released. These photographers were given the opportunity to document the NYC Green Cart Initiative, a program that provides fresh fruits and vegetables to underserved urban communities. Each photographer approached this project from a different point of view, offering a unique perspective of the Green Cart program. The images have also been curated into an exhibition at the Museum of the City of New York titled Moveable Feast: Fresh Produce and the NYC Green Cart Program. Both the exhibition and the commission were made possible with the generous support of the Laurie M. Tisch Illumination Fund. Steacy’s work was inspired by his interest in the relationship between a community’s socio-economic status and its health records. One of the biggest debates in public health today is the fact that low-income households have the highest reported rates of illness, while high-income households report the lowest. 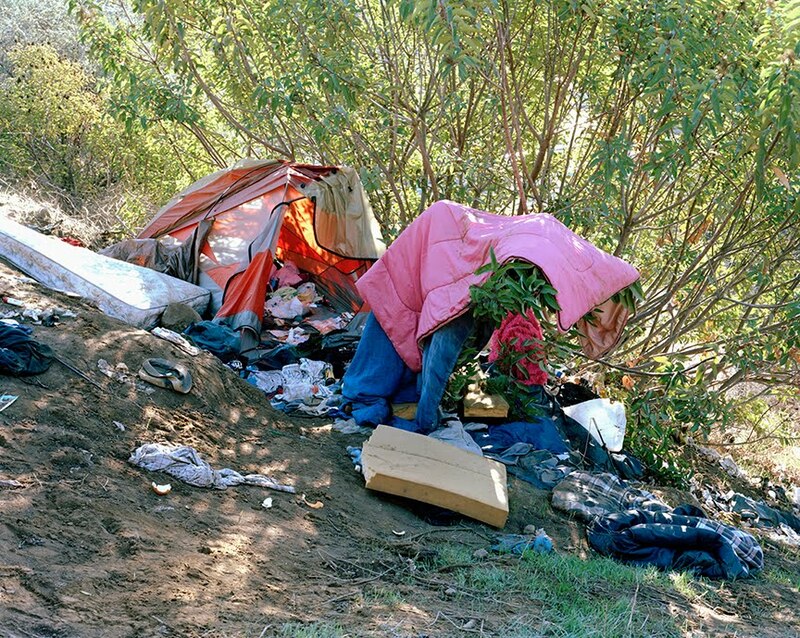 Over the course of a year, he photographed the geographic areas where the highest reported instances of poor health and people living without health insurance overlap with Green Cart locations. Empty Vegetable Stand on Valentine’s Day, 3rd Avenue & 110th, New York is a striking example of one of these neighborhoods. This entry was posted in Contemporary Photography, Exposures, Uncategorized and tagged American Photographer, American Psyche, American Workforce, Aperture, Artist Michael, Capitol Building, Charles Gandee, City Institutions, Contemporary Photography, Corporate Greed, Documentarian, Events & Exhibitions, Gary Indiana, Harsh Realities, Laurie M. Tisch Illumination Fund, Limited-Edition Photographs, Main Artery, Mazzeo, Michael Mazzeo Gallery, Moveable Feast: Fresh Produce and the NYC Green Cart Program, Museum Of The City Of New York, news, Outspoken Critic, Photographer, Photographers, Photographs, Photography., Scott Walker, Seductive Images, Steel Plant, Valentine S Day, Vibrant City, View Camera, Will Steacy on April 28, 2011 by Aperture Foundation. 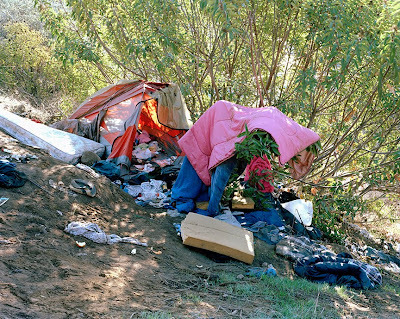 Investigating “some of the problems and paradoxes within the structure of contemporary American society, and the ideologies of freedom and advancement on which it was founded”, Ben Murphy’s Homeless Encampments of the American West depicts the temporary shelters of ‘homeless’ individuals who have taken up semi-nomadic residence in California and Nevada. These ad-hoc living spaces which seem to inhabit the ‘wastelands’ on the periphery of the city, are in a sense sculptural representations of a facet of the American psyche and, an evocative twist of the idea of the American ‘settler’. 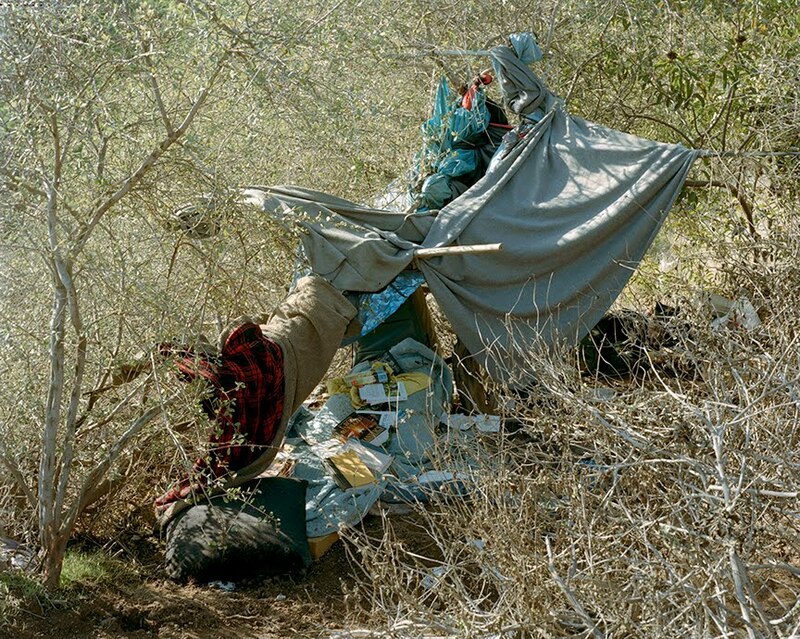 Murphy writes: “With limited resources in insecure environments, a sense of home and identity is achieved and established through an improvised impermanent architecture. Ben Murphy’s career initially began with a BA in Graphic Design at Northumbria University, and, after years spent working as a musician, actor, assistant designer to Neville Brody and a stint as assistant art director for Face Magazine, Murphy settled on photography. It seems the choice was well made. Murphy has since exhibited widely, and is held in permanent collection at the V&A and the National Portrait Gallery and has held shows at The Courtauld Gallery, Plymouth City Art Gallery, and Steiglitz19. He has also been featured in publications such as Portfolio, The Telegraph Magazine, The Sunday Times,Wallpaper, The Independent and published The U.N Building with Thames and Hudson in 2005. This entry was posted in Ben Murphy, Uncategorized and tagged American Psyche, Assistant Art Director, Ben Murphy, City Art Gallery, Contemporary American Society, Courtauld Gallery, Face Magazine, Freeways, Homeless Encampments, Homeless Individuals, Industrial Areas, Living Spaces, National Portrait Gallery, Neville Brody, Paradoxes, Plymouth City, Public Spaces, Sense Of Home, Telegraph Magazine, Wastelands on March 23, 2011 by Tim Clark.